When I started experimenting with basket weaving for our Bartram Collection, I found it was much easier to start a basket with a solid bottom. I decided to use leather to create a base for my baskets. 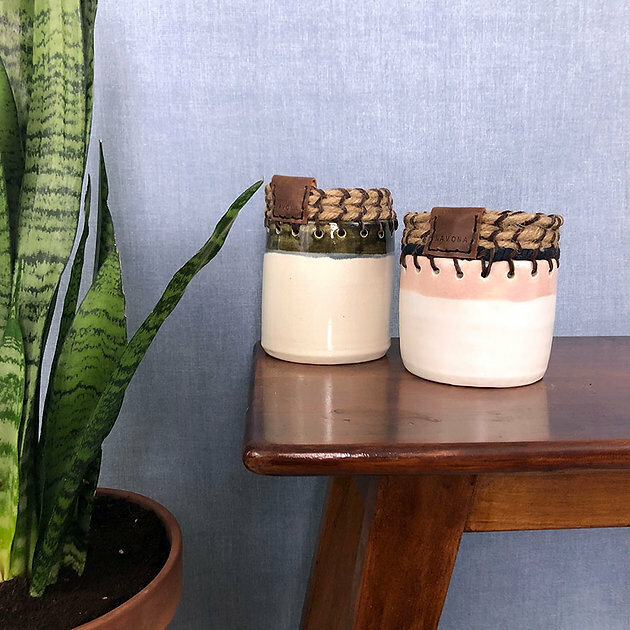 For our Mid-Century Modern Collection, Beth and I looked at these baskets and realized that ceramics could be a really interesting twist on this technique. Beth created ceramic color blocked vessels with holes around the top to be used as the base. I then used sisal rope and leather cording to add a few inches of basket weaving to the rim of the vessel. We love the way these unique jars turned out and can't wait to see what they get used for! Plants? Utensils? Shelf decor?